Say ‘Cheese!’ And chocolate. Add in wine, beer and other local crafts, and you'll see why March is a picture perfect month in the Rogue Valley. Southern Oregon knows about indulgence. Wine, chocolate and artisan cheese — the trinity of decadence. A triple threat that will leave your palate speechless. And the journey to this culinary utopia begins in Medford and the Rogue Valley. The Oregon Chocolate Festival and Oregon Cheese Festival are go-to events for foodies of all ages. Whether you’re planning a deliciously romantic second honeymoon, a girls’ outing, family vacation or a fantastic foodie weekend, both of these festivals hit the mark. Kids and adults will love wandering through the rows of chocolate creations at the Oregon Chocolate Festival. Even Willy Wonka would be envious of the variety and selection of chocolate available. Held March 9th-11th in Ashland, the festival features dreamy confections from dozens of West Coast chocolatiers. Chocolate lovers dream about — and eagerly await — this weekend every year. If the kids are with you, the Charlie’s Chocolate 5K Run/Walk is fun for the entire family. It also burn off a few calories from all that chocolate. Delicious prizes will be served to the racers, and for an extra splash of silliness, you could dress up as your favorite “Charlie and the Chocolate Factory” character! If you’re seeking a dose of pampering, reserve your spot for the Spa Chocolate Cocktail Party. Music, cocktails, appetizers and a homemade chocolate scrub complete the afternoon. It wouldn’t be a month of decadence if you didn’t indulge in a wide selection of artisan cheeses. On March 17th and 18th, the Oregon Cheese Festival puts cheeses of all varieties on display in a farmer’s market-style event. Including Rogue Creamery's internationally-prized blue cheeses, the weekend will showcase cow, sheep and goat cheese from Oregon and Western U.S. creameries. 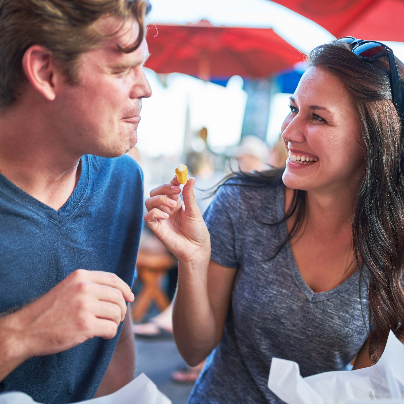 In addition to eating as much cheese as possible, enjoy pairings of the finest Southern Oregon wine, craft beer, ciders and food. Sample and purchase the cheeses, specialty foods, beers and wines which tickle your palate. Over 100 vendors are gathering in one place to offer you the finest artisan foods and beverages in Medford and the Rogue Valley. If you’re hungry for a culinary adventure, visit Medford in March. You’ll nosh on unforgettable chocolates and cheeses — and leave with a few (or many!) treats to enjoy later.